Soon after I arrived in Sitka, Alaska I had the opportunity to join a large group of paddlers in a warrior canoe for a 12 mile ocean race (Sitka Sound Ocean Adventure Race). It was a long, slow process, but well worth it. Photo by Bill Greer. We would follow up this race with the Kake Dog Festival Race (1 mile) in Kake, Alaska. In 2017 I had the unique opportunity to crew for the Legends of the Road team for the Race Across America. Two of the cyclists were using hand cycles. Very inspirational to see them participate in a grueling event. I was honored to have a number of my photos inserted into a book that documented the journey. Photo is coming down Wolf Creek Pass near Pagosa Springs, Colorado at sunrise. Death Valley is a fascinating location to explore. The Race Track is a one of a kind place that is mysterious and remote. A 35 ish mile drive over dirt road is the approach to the Race Track where rocks move along the dry lake bed. Some of the rocks are quite large. Science does not have an answer for what factors cause this to happen. Taken from one of my favorite videos, this is a young rattlesnake, who was very curious about the guy with the camera. This happened at the end of my run and was across the street from the house. My meeting with the sea lion in Sitka, Alaska. I happened to be paddling along in a kayak, watching two sea lions a little ways away. Then one of them decides to check me out. Keep in mind this is sort of an iceberg scenario. Under the surface is a whole lot of animal. Up to 8 feet long and tipping the scales at up to 770 pounds. To make this equation more interesting is that I am in a tippy kayak, alone and very fearful of water and I may be the worst swimmer on the planet. I ended up taking video until he was right in front of me, with his mouth wide open. It all ended well but was quit a moment. A bunch of smiling faces since we all survived the Canadian Death Race. Amazing weekend as I Challenge Diabetes created two teams of five and two solo racers for the 77 mile race with 17,000 feet of gain in the Canadian Rockies. All of the racers have type 1 diabetes. My side story is that I had recently had knee surgery and requested the easiest leg (12 miles). With people bowing out or avoiding the longer distances I landed with longest and possibly the hardest leg (24 miles and 5-6,000 feet of gain). A challenging time on Mt. Hamel but I am so grateful for the unique opportunity. Photo by Marco Bianchi. Yes, those are tea kettles and they are about 30 miles down a dirt road in the middle of (basically) no where. On the way to The Race Track (where rocks move across a lake bed. Scientists are still unsure of what makes the rocks (some are quite large) to move and create tracks on the dried lake bed) you pass Tea Kettle Junction. Ahhhhh, the Australian Rappel, a very different way to raise the heart rate. This is the first and only time I experienced this totally unique opportunity. It is a bit scarier and does not seem as ‘secure’ but thank you, Australia, for another adventure. This is above Boise, Idaho with my No Limits diabetes adventure group. Almost dark and I had just completed an epic run. I ran from Sitka National Historic Park to Mt. Verstovia, up the mountain, down and then to Gavan Hill, up the mountain, down and back to the car. Horrendous weather greeted me, and I did mix in some walking, but it was my own designer adventure that I am so glad I nailed it. Took eight hours and about 5,000 feet of gain. Looking toward the Catalina Mountains I saw something caught in the thermals as it slowly drifted to earth. I had time to run and get my camera and run back out to the porch as this reasonable size item made its way to find a home on the desert floor. I did search for this mysterious item that was likely dropped/came out of a helicopter. Photo above has not been edited and is not a great photo but it was unusual sight. This classic vehicle is located across the Columbia River from The Dalles, Oregon, in Washington state. I ventured into the area with very vague directions of where the car resided. I left with a vehicle that had not been located and a search on my calendar for a second trip. I had a hunch where it was and was successful in my search. It is a not near a roadway and sits in a field and out of sight. I look forward to a trip across the river when the flowers are in brilliant bloom. This memorable moment was captured by Barry Glazier at the Navajo Bridge (Page, Arizona). As I have shared in video format, my jump was rather interesting and dramatic, as I bounced above the Colorado River my video camera flew off. This epic photo is me with the cam in hand. As I am bouncing, spinning, upside down and shocked with what just occurred. I now needed to put the camera back on. My thought at this point was that I had made a miracle catch but was now going to lose the camera to the river trying to re-mount it. It thankfully, all worked out and I got some amazing footage. During the Race Across the West (Oceanside, CA to Durango, CO) I was crewing for Team Cyclonauts. This photo is near time station #1 in Borrego Springs, CA and I was seeking some unique and slightly different photos from the race. I had tried to 'frame' the rider before this one and missed horribly. It is a timing issue and I was lucky to have this one worked perfectly. The beauty of this photo is that this is Christoph Strasser, who is currently leading the race by over 300 miles. I did not get a good look at the rider when he rode up so was very fortunate to capture the solo leader in a different viewpoint. Within two hours of arriving back home from the Race Across the West (Oceanside, CA to Durango, CO) we had a bobcat come to our door. There is a lot of wildlife in our niche of the desert north of Tucson and this year has been exceptional in sightings. The bobcat above was dealing with temperatures around 105 and is on the thin side. Thankfully, for him and us we had a good rain the next day. He is roaming the neighborhood in search of water and possibly food. 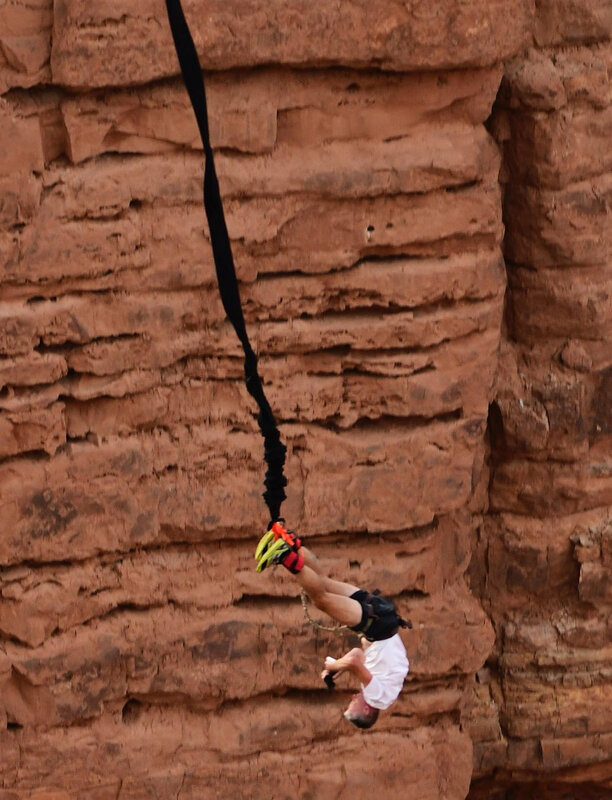 A bungee jump at the Navajo Bridge (Grand Canyon, Arizona) gave me an opportunity for adventure and a photo to post on this page with a crazy story. My leap went very well but on a bounce my camera flew off. Somewhere beyond a miracle, I caught the camera. This was a monumental moment but I realized that I had to put the camera back on my head so that I had my hands available to hook up to the retrieval rope. I envisioned catching the camera and then dropping it as I hung upside down, spinning wildly trying to put the camera back on. It all worked, Phew! and have a video (in my video section) and this snapshot from the film. Yes, that is my shoe joining me off the Glenn's Ferry Bridge (Glenn's Ferry, Idaho). The gravity test did prove that gravity is alive and well and does still give you a rush. I am not sure how this incident happened but there is a smile on my face that the moment was caught in a photo. It was also caught in a video (see my videos section). Amazingly, there was a single boat that was fishing for sturgeon and was the only boat we saw all day. They were only there during my jump, scooped up my shoe, dropped it off onshore and then they left. Angel boat? While visiting a ghost town in Colorado we saw a bison on the other side of the fence. We were surprised at our unique sighting as there was not much of anything in the area that would indicate anything other than old structures, trees and grass. We were surprised to see that the fence had a couple gaps and the bison was soon roaming the streets which allowed for some interesting photos and videos. We came across this interesting sight along a 4 wheel drive road in an isolated section of the Grand Staircase-Escalante National Monument in Utah. The bull was stuck in the cattle guard, there was not room to get around him/her and we were 1-1.5 hour from a longer road back to Highway 89 and cell service to notify someone of the bull drama. This was done and the bull was rescued. This was one of my vlogs in my vlog section. Getting paid to ride my bike! Not quite a professional athlete but I did work as a bicycle courier in Boise, Idaho. I was the only courier with a bicycle attached and I loved it. Not quite loving it on 5 degree and 100 degree days but it was an awesome opportunity to learn my new community, experience the weather and get my exercise while on the clock. I would also help write/research a Boise trail book (Boise Backcountry Adventures) which paid me for running (we ran all of the trails, over 1,000 miles, unless it was a canyoneering section). A rare individual that is paid to run and paid to ride and yet is not an top-notch athlete. My previous home was on Baranof Island in a small community called Sitka (Alaska). Many Alaskans feel it is the most beautiful city in Alaska (and there are a lot of stunning cities in the Last Frontier). Sitka has very few chain shops/restaurants/services. Most are mom and pop run businesses. One of the few chain businesses is a McDonalds. This unbelievable view is out the front door of the McDonalds. Hard to imagine a more impressive view from any other McDonalds on the planet. Not often that you can sleep on a bridge. This is the Navajo Bridge near Page, Arizona. The exciting part of this story is that we were here to bungee jump. Matt and I had driven all night from Boise, Idaho to stroll onto the bridge at sunrise, taking in the scene of sleeping bags, gear, etc. strewn along the bridge. Matt and I did not have time to sleep, but we did have a sensational time on and off the Nav. I may post another photo as we were joined by the Discovery Channel to film us. Unfortunately, they did not air the episode but some of their crew were involved in the jump. The short story behind the ability to catch some ZZZZ's on this bridge is that this is the original bridge over the Colorado River and a new bridge was built, leaving this bridge for taking in the beauty of the area. And for us, bungee jumping! Bobcats are an infrequent sighting in the neighborhood and a cause for an intent scramble for the nearest camera. This episode involved four bobcats, three of which were young, and adventurous. All three of the youngsters had played follow the leader, running up the wall. I had missed the first two and their epic run down the wall but did capture the final one. Family was moving on so I knew that this one would eventually use gravity and balance to reunite with the family. There is a clip in my video section of the bobcat family. Lemurs are not a strong attraction in Sitka, Alaska but thought that this would be a fun photo. I was at the Luxury Travel Show in Las Vegas representing Sitka, Alaska. Across the aisle was a booth with lots of interesting animals (San Diego Zoo). Seizing the moment and dealing with a lemur that wanted nothing to do with a rain forest location helped create a rare photo. And I was caught in a suit and tie while wearing a lemur. While visiting Taos, New Mexico with my friend Eric, I had this crazy idea to sit at the edge of the canyon wall. Feet dangling, Eric was nervous having me sit there and snapped a really quick photo. He did not quite get the dramatic photo I was anticipating but it is a stunning location. We had actually done a similar photo to my left about 25 feet away but it did not get the river, bridge and canyon walls in a nice tidy shot. California Condor at Horseshoe Bend (Page, Arizona). A very rare bird (count is at 83 for Arizona and Utah-2016). 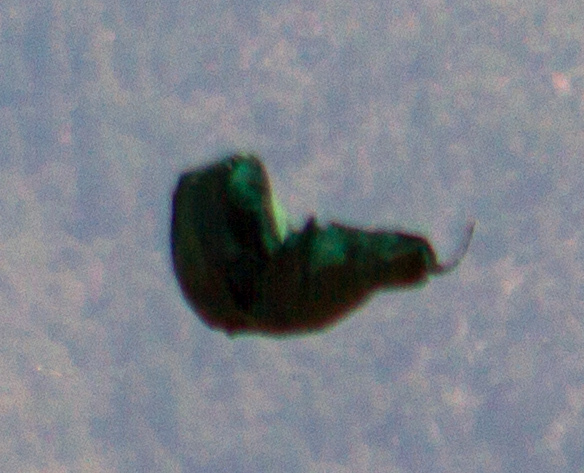 We had seen him circling high above and saw him dart under our view and onto the canyon wall. Did not expect to see him on a prominent ledge, posing for the camera so grabbed the opportunity. My first vlog is on this encounter. This photo was taken during the Race Across America (Oceanside, CA to Annapolis, MD) by Peter Sandholt's crew (Denmark). I have been super fortunate to have been involved with the race for seven years. Initially I tried to get on the Team Type 1 team to ride in their first Race Across America in 2006. I found out that they actually wanted to win the race and that scratched my name off the list. I was offered a crewing job and that is where I became very connected to the unique race. This photo is from 2015 where I had the opportunity to drive the Media 1 team covering the race, mainly the lead riders. This was taken of rider Peter Sandholt going up Wolf Creek Pass (Pagosa Springs, Colorado). I love the capture of Media 1 frantically doing their job and the realization that I was driving in extreme closeness to the cyclists to capture the photos/videos. A stunning rainbow in Sitka, Alaska. The timing was incredible as our office was hosting the Alaska Travel Industry statewide meeting in our hometown. I do not think that many of the participants saw this nugget of color, I was glad that I did. To catch the magic I had to call a media visit with someone I had worked with before and delay our meeting. No problem, catch the rainbow of a lifetime! While caving in Crystal Cave in the Chiricahua Mountains of SE Arizona we invited a former University of Arizona football player Keith to join us. 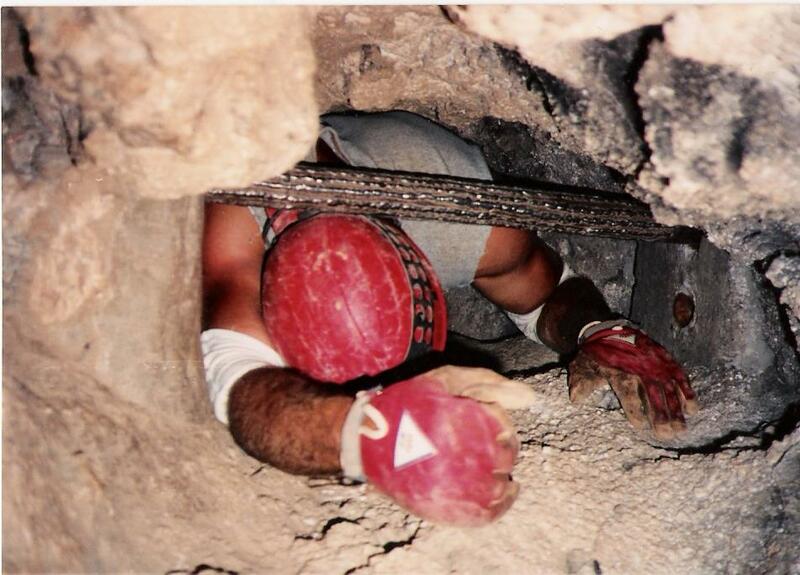 The joy of this photo is that we could have taken the remaining bar off of the gated entrance but chose to see Keith work his way into the cave. I believe this was my first real connection with the American Diabetes Association and other people with type 1 diabetes. I joined the Seattle ADA on a road trip to Glacier National Park (Montana) for a backpacking journey to Granite Park Chalet. Stunning terrain and great company. I will probably never forget celebrating Christmas at the Chalet. Since it was the end of the season they celebrate Christmas on August 25th. Anders Tesgaard climbing Wolf Creek Pass in Colorado during the Race Across America (2015). This is a touching photo as it is the last time the Media 1 team would see Anders. While riding in West Virginia during the race he would be hit by a truck and would be in a coma until his death. I had not googled his status for awhile, but he passed away four days ago (February 16, 2018). 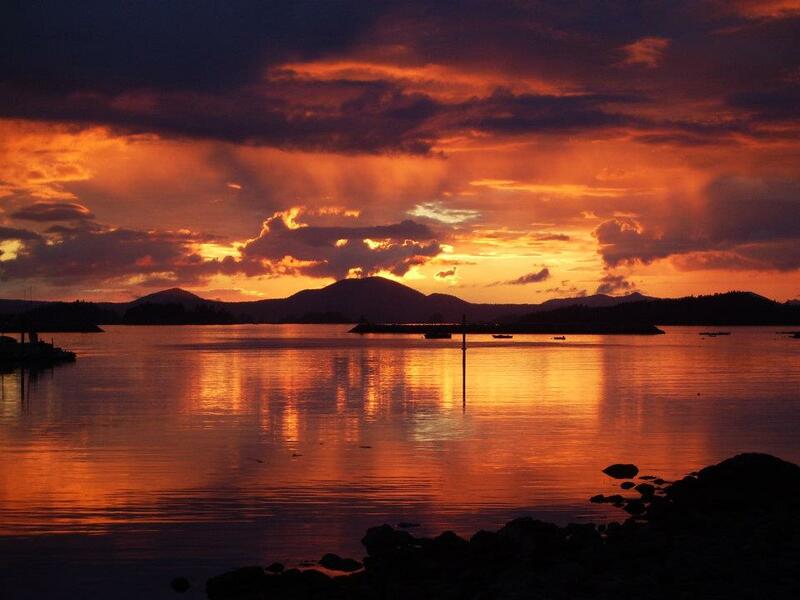 Ok, so this isn't my photo, it was taken by Heather Cole on a kayak trip out of Sitka, Alaska. 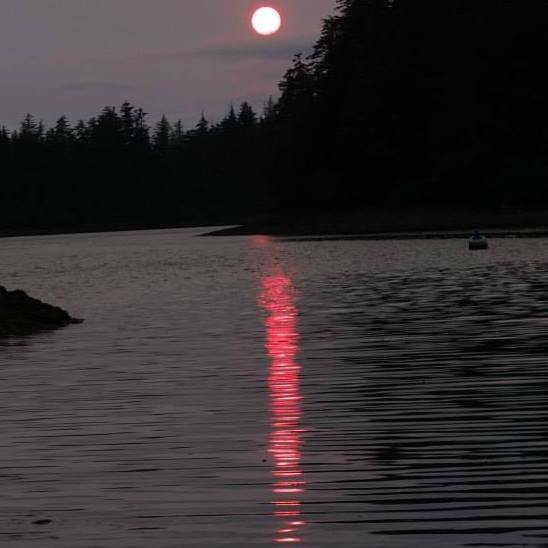 Heather also has type 1 diabetes and this was a journey that No Limits joined SAIL (Southeast Alaska Independent Living) for a kayak trip to Samsing Cabin. The colors created by the sun going down were caused by forest fires near Fairbanks, Alaska - 700 miles away! I did snap the same photo but her camera did a much better job than mine in low, but unique lighting. A night time bungee jump off of a high bridge? Why not. Got a call that such a crazy activity was planned for that evening and that I should join in on the fun. I enjoy new challenges and while I had many jumps under my belt, darkness and being connected to a bungee cord was a first. The darkness made this jump a little less nervy as this is a heart thumping location as you stand on a narrow catwalk, seeing the Snake River 160 feet below. A single strand of cable on each side of the catwalk is your safety. You can see a couple of glow sticks dangling far below (lower third of the photo slightly on the right). Sitting in a WWII bunker in Sitka, Alaska watching (and taking photos/videos) of the planes as they use the Sitka Rocky Gutierrez airport. One of the most challenging airports to fly in and out of. Runway was lengthened by dropping rocks, dirt, etc. into the Pacific Ocean. Very narrow with weather changing by the minute. There are many WWII bunkers and some buildings that were built to help defend the United States against possible attack. Always interesting to locate and explore the bunkers. There was a bunker that most people did not know about that was only about one mile from where I lived.